Digital gaming business in India has witnessed tremendous growth over the past few years and consequently, a new breed of gaming fanatics has emerged. Of course, initially, there were only simple computer games and inexpensive, handheld gaming devices that kept us engrossed. And next came the all-sweeping wave of console gaming with affordable PlayStations and Xboxes. But with the spread of Internet, mobile networks and 3G connectivity, the next big frontier revolves around digital gaming. The best part about the digital gaming market in India is that it is not dominated by a couple of big players and there is equal scope even for entry-level players. Simply because there is no dearth of consumers in a country with more than 840 million mobile connections and over 12 million broadband subscribers (note that we use the term 'subscribers' and not 'users', which means that the number of actual users will be much more). Therefore, there is something for everyone and everybody can have a piece of the growth/profit pie. Reports by KPMG and FICCI state that the Indian gaming industry is expected to grow at a CAGR of 31 per cent and may become a billion-dollar industry over the next four years. 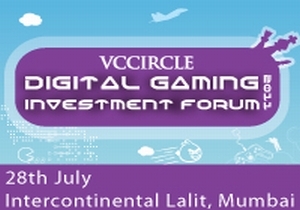 In the run-up to the VCCircle Digital Gaming Investment Forum (to be held on July 28 in Mumbai) that intends to deep-dive into the opportunities generated by the anticipated gaming revolution in India, we will be tracking the gaming business closely with a series of articles over the next few days. Today, we will focus on the various opportunities available in the digital gaming space. With the increasing popularity of social networking sites like Facebook and Orkut, the popularity of social games has skyrocketed as well. Globally, around 600 million users play social games and the market for social gaming touched $1.5 billion in 2010. On an average, Internet users spend a quarter of their total surfing time on social networks alone. CityVille, a game by Zynga, had more than 80 million monthly active users (MAU) on Facebook in January, 2011, followed by another popular game FarmVille with around 58 million MAU. Other popular games include MafiaWars, Texas HoldEm Poker and CafÃ© World, according to Inside Social Games. In India, another key trend in the digital gaming space is that tier II and tier III cities are overtaking the metros. This throws up another exciting market; perhaps there is further scope for games developed in local languages and based on indigenous themes. Although social games are hugely popular, online games are not lagging behind either. And the good thing about gaming is that technical sophistication is not really a benchmark here as games come in various formats. There are simple games like card games and arcade games, and then there are sophisticated ones like flight simulations. Hence, digital gaming caters to people of every age, making everyone a potential consumer. Additionally, virtual worlds, also known as metaverses or massively multiplayer online games (MMOG), have attracted a large number of users. The most popular of those are the World of Warcraft and Second Life, which have more than 20 million 'residents' worldwide. These are not very popular in India yet, but Travian, a browser-based game that enables users to play with others, has caught the fancy of Indian gamers. It already has a registered base of 60,000-plus users in India. Another big reason for the growing popularity of digital gaming is that nobody wants to play alone. They want their friends and relatives to play with them. Yes, this can also be achieved via consoles like PlayStation, Nintendo Wii and Xbox, but these allow only a limited number of players at a time. If one wants to add more players, they will have to do so via networks like Sony's PSN. But in that case, all participants must have consoles and active login ID's for the network. All in all, this is a costly affair, but in the digital space, users can add any number of players and engage with them from anywhere across the globe. In the process, the entire world can stay connected and everyone becomes a potential consumer. In a country which has more than 840 million mobile subscribers, it's not surprising that game developers will have endless opportunities. With the growing popularity of smartphones in India, mobile gaming is no longer limited to traditional Snakes and Tetris. Moreover, mobile gaming in the country is expected to notch up to Rs.1,710 crore in revenues, making it extremely attractive to developers and investors alike. Moreover, with the launch of 3G services in the country, people are no longer stuck to their PC's, notebooks or netbooks for online gaming. Enthusiasts are now able to access high-speed Internet via mobile phones and networked mobile gaming may soon hit the market in a big way. Rohit Sharma, CEO (Digital) of Reliance Entertainment, said, "We want to scale up our mobile gaming business, both in India and globally. Therefore, we are acquiring IPs which will be relevant for global distribution. In the mobile gaming space, we have scaled up our development capabilities and hired senior game developers from outside India. In addition, we will strongly focus on inorganic growth for our WAP site M.Zapak.com." Also, with the introduction of various operator-independent application stores, game developers can easily monetise their products. Today, games lead the popularity chart of monthly apps use at 64 per cent, followed by weather apps and social networking apps. What's more, as much as 93 per cent of the people who actively download apps (meaning those who have downloaded an app within the past 30 days) are willing to pay for the games they play. For example, there is the biggest selling mobile game Angry Birds. More than 6.5 million copies have been sold since its release and plans are afoot to make it a full-fledged movie. Furthermore, to make the most of the opportunities presented by digital gaming, many of the big players are actively adding and improving their online gaming portfolio to attract more consumers. Hungama Digital Entertainment Pvt Ltd has recently launched TheGameBox.com, a site for casual gamers. This interface is Hungama Game Studio's GamingHungama.com in a new avatar, with a social gaming angle. Gaming firm Zapak Digital Entertainment Ltd, a subsidiary of Reliance Entertainment, has also launched a new subscription-based gaming service called Zapak Plus that offers 120 games from international publishers. Watch out for our next report in the series that will look at monetisation in the digital gaming business.